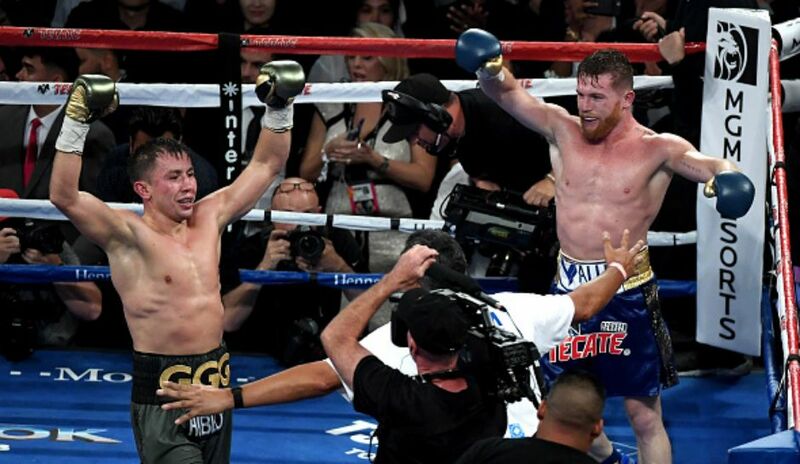 Golden Boy Promotions CEO Oscar De La Hoya has continued to support his marquee fighter Saul “Canelo” Alvarez 49-1-2 (34) despite the Mexican hero twice submitting dirty tests for performance enhancing drugs. The 27-year-old tested positive to the banned substance clenbuterol twice in February resulting in his high profile May 5 rematch against world middleweight champion Gennady Golovkin being cancelled. Alvarez blamed the test results on tainted Mexican beef. After touching down in New York City this week former boxer De La Hoya continued to spruik the idea of a rematch with Golovkin with September the targeted date to coincide with Alvarez’s six month suspension from the sport. De La Hoya, once the biggest box office draw in boxing below heavyweight, wasn’t impressed by Golovkin’s new Jordan Brand advertisement that threw shade at Alvarez and his tainted beef excuse. De La Hoya is standing by his boxer’s claim that contaminated beef caused the positive test results and says that there won’t be a repeat of those results should the fight get rescheduled for September. “He’ll get tested every single day from now on until the fight,” he said. Golovkin is now facing Vanes Martirosyan on May 5 at the StubHub Center in Carson, California as a late replacement for Alvarez.